Italy will be seeking their first hat-trick of wins in a Six Nations fixture when they tackle Scotland at Murrayfield. The Azzurri won the Championship matches against Scotland in both 2007 and 2008 (though Scotland did manage an interim Rugby World Cup pool match victory at Saint Etienne in 2007). The nations meet for the fifteenth time since 1996 in a major Test and it is the tenth time they have met in the International Championship since 2000, when they launched the Six Nations version of the tournament. Scotland head the overall series by nine wins to five. Scotland holds the record for the highest score, the biggest winning margin and highest try-return of the series. They won 47-15 and scored six tries at Murrayfield when the sides met in a World Cup warm-up match in August 2003. Italy's best result is their 37-17 Six Nations win at Murrayfield in 2007, when they scored four tries. Diego Dominguez, with 29 points for Italy in Rome in 2000, holds the series record for most points scored in a match. Brendan Laney scored 24 for Scotland, also in Rome, in 2002. Kenny Logan set the record for most tries in a match, scoring two for Scotland when the sides first met, at Murrayfield, in 1996. Luca Martin crossed twice for Italy there in 1999. Logan also heads the list of try scorers for the overall series, crossing four times in six appearances between 1996 and 2003. Five Italians, including the Bergamasco brothers, have scored two tries in the matches. The other major records for the fixture include Chris Paterson's overall tally of 96 points from ten appearances (compared with 94 for Italy by Diego Dominguez), and Scott Murray's eleven appearances (1998 to 2007) in the series. Chris Paterson and Simon Taylor have played ten times. Alessandro Troncon and Andrea Lo Cicero each played ten times for Italy. 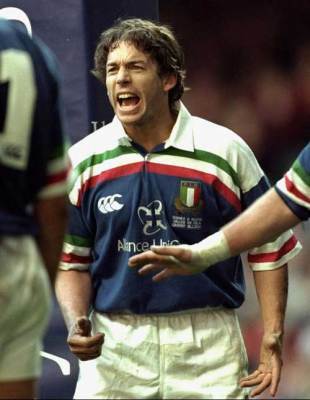 The only player dismissed during a Scotland-Italy match was Massimo Giovanelli at Murrayfield in 1999.